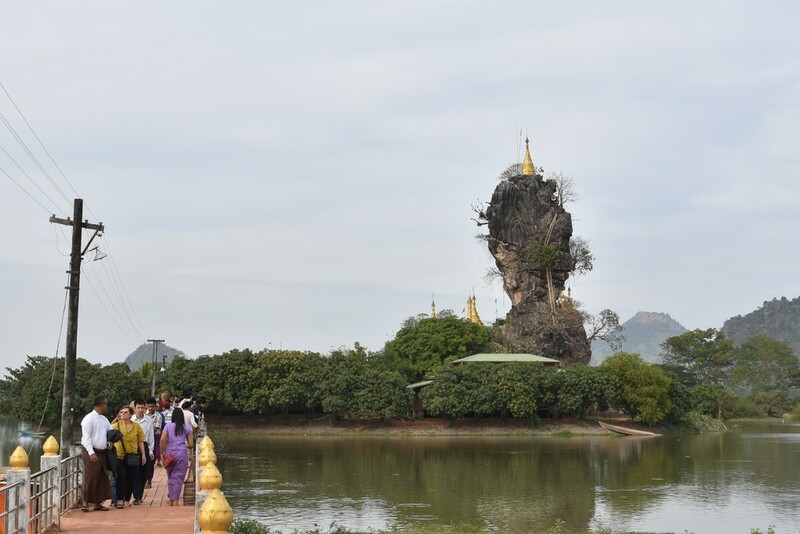 Hpa-An is situated in the Karen state were it is the capital. It is in the northern part of the south Myanmar. Even though it is the state capital and has approximately 75.000 inhabitants it feels like a small city. The houses are lower than what you find in Yangon and Mandalay, most only 2-3 stories high, except for a few new hotels that rises 5-8 stories. Karen state was not recommended to tourist until 2014 or 2015 as a freedom movement with armed rebellion against the Yangon dictators operated in the Karen state. But in January 2016 the city and the area was safe to travel in. A little lazy slow moving feeling is the best description I can come upon. There is not much to see or do in the city itself. But you should take a stroll around the marked near the clock-tower and the narrow streets city center. If you want to watch the sun set in the city I recommend to visit a temple at the river bank in the northern part of the city. Also in the northern part of the city you find a beautiful view of a lake with a bridge. The park gives you the opportunity to get a little quiet from the streets and to get a lovely picture. At the other end of the lake you find Veranda which is a youth community Cafe. 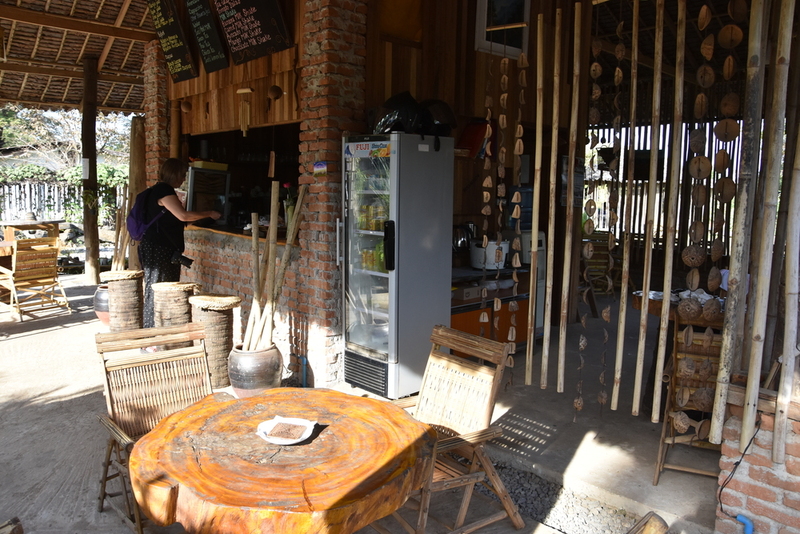 They server mostly ecological foods and work to train young people to interact with foreigners. The place is clean, staff is friendly and the food is good. As I stated in the beginning, there is not much to do or see in the city, but the area around the city provides some interesting places and sights. The easiest way to get around the area is to rent a tuk-tuk or taxi for the day. 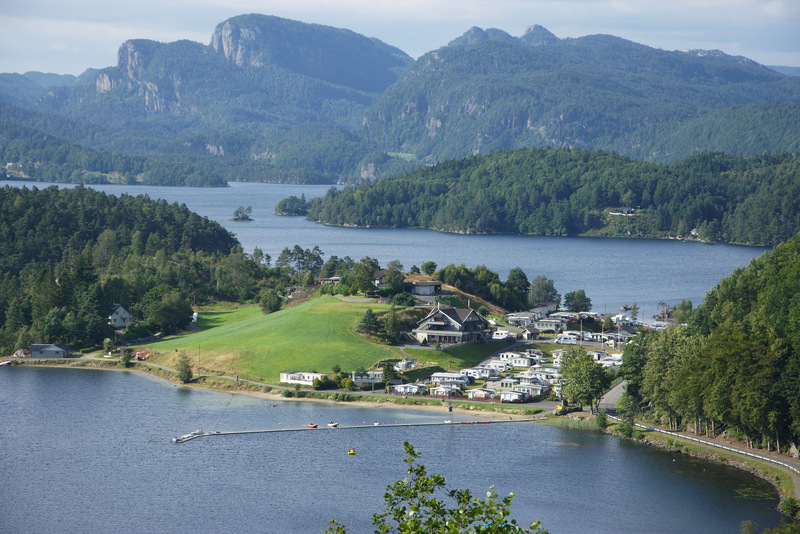 We stayed at Hotel Angels Land were the hotel had a brochure with map of the area and a series of sights. They arranged a tuk-tuk for us for $20 and communicated with the driver about which sights we wanted to see as the driver did only talk very little English. We started the tour at around 8 AM and were back at the hotel around 5 PM. 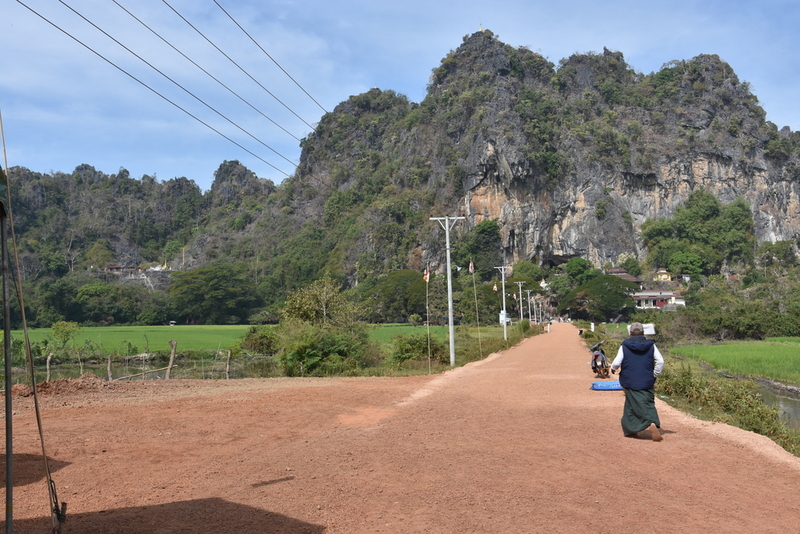 The country side around Hpa-an is mostly flat, but scattered around there are lime stone cliffs raising above the landscape, some only a little over the surrounding area but some rises up to more than 700 meters. So in most places you’ll have a calm ride – as calm as the bumpy road will let you. 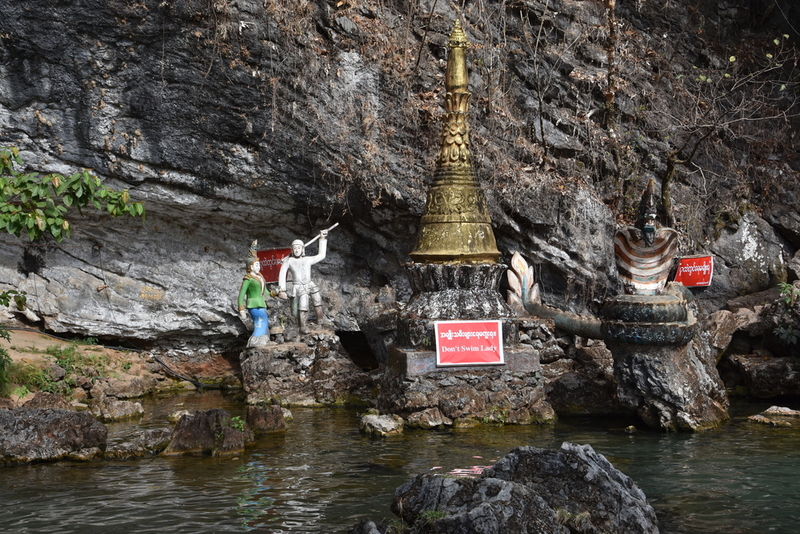 The first stop on our tour was the Kawt Ka Thoung Cave which is a small cave with a few Buddha images inside. 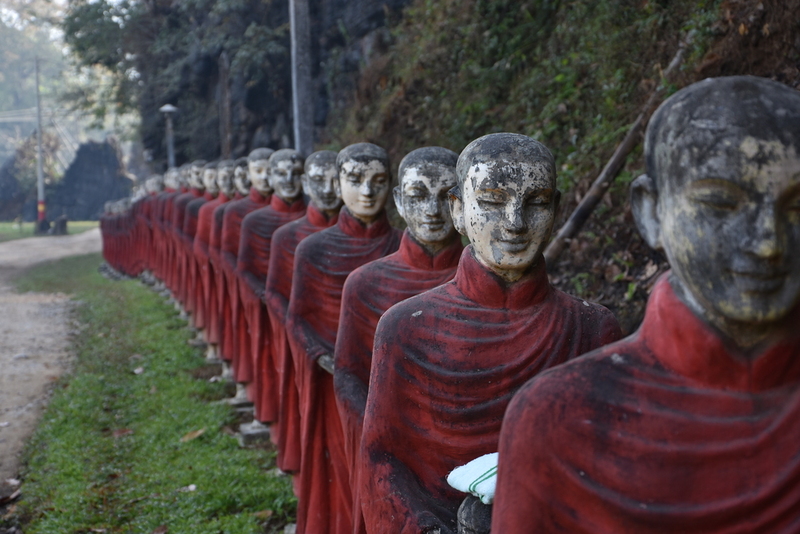 More impressive is a row of Monk statues lined up for the morning tour around the city. The statues stands man high with their brown robe and collection bowl in a line of 150 statues. Near the cave there is a village surrounded by rice paddies, to go from the road to the village you need to cross a long low concrete bridge. While we were there the villagers were working in the fields which provided some very picturesque scenes. While we were driving from Kawt Ka Thoung Cave to Sadan cave our driver suddenly pulled over in the middle of a forest. He urged us to follow a path into the forest. In the forest we found a lot of stone statues of sitting Buddhas, approximately 1.5 meters high. Trying to count them was troublesome as we did not want to leave the paths and the forest some places were rather thick. But we counted several hundreds. The driver told us that there is 1.121. 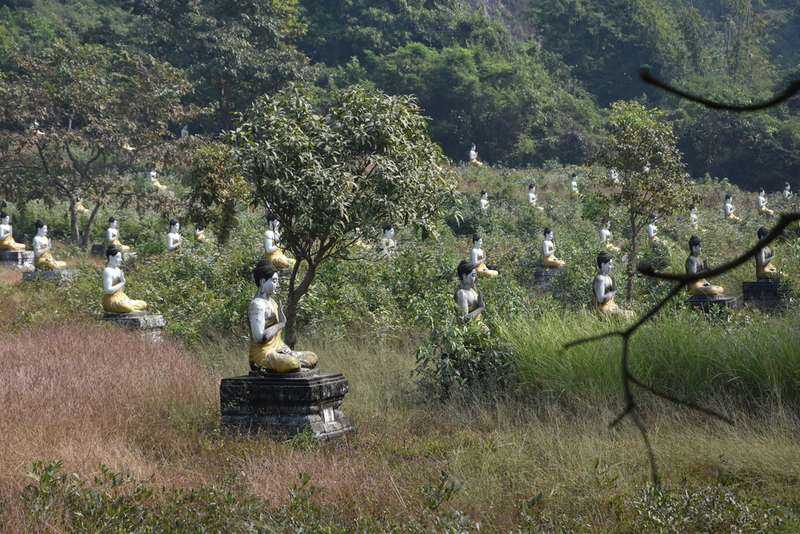 Impressive that so many heavy statues are moved into a forest on a hill side in the middle of the country side. Sadan Cave was the most impressive visit on our tour. 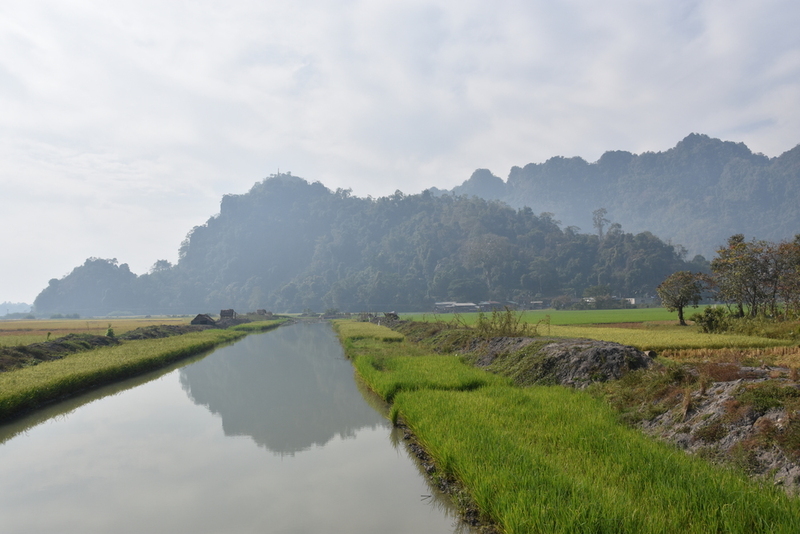 The case is situated in a large limestone cliff surrounded by rice paddies, a dam connects the road to the cave. A few stairs up and you enter the cave. 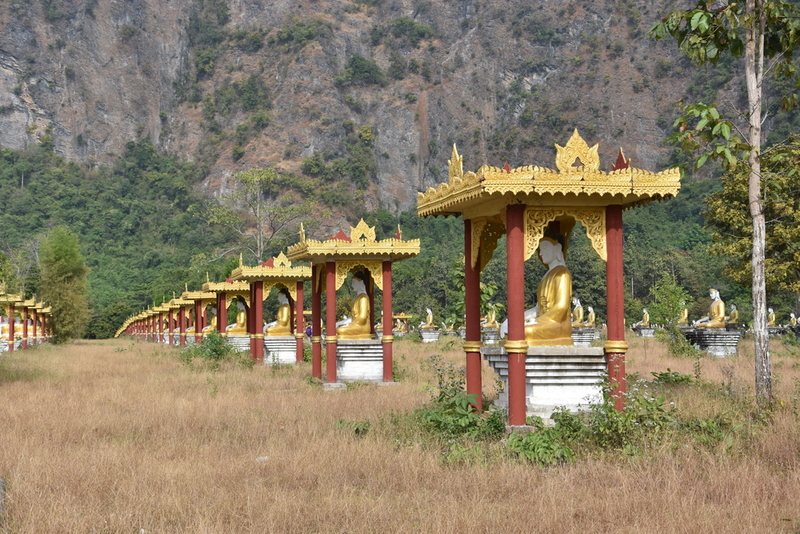 The cave is used as a temple with lots of Buddha statues, among them a reclining approximately 20 meters long. When you enter the cave you are urged to pay 3.000 Kyats, if you do the light will be switched on. If neither you or anybody else pays, the lights stays off. 3.000 doesn’t keep the light on all day, when the monks think you got enough they switch off, so bring a torch as the back of the cave will become pitch dark. The holy area do not cover the whole cave, so when you go to the back of the cave you can wear your shoes again. Walk through the cave, try if you can see the bats, you can certainly hear them. When you leave the cave, opposite the entrance, you’ll be facing a small lake, all most surrounded by cliffs. The cliffs prevents winds to reach the lake, and so the lake can be blank as a mirror. Don’t take a boat over the lake at once. Turn left when you exit the cave and walk over the field and at the back of the field you’ll find another cave with Buddha statues and shrines. The cave is not just gray like many other but has spots of red and blue colors. The path over the field can be muddy so walk with care. Back at the lake you should take a boat back to the entrance. There are 2 types of boats, one for Burmese people and one for foreigners. The boat for foreigners will load up to 4 passengers and cost you 5.000 Kyats for the boat. The boats for Burmese is 50-70% larger, but it will load around 20 persons. 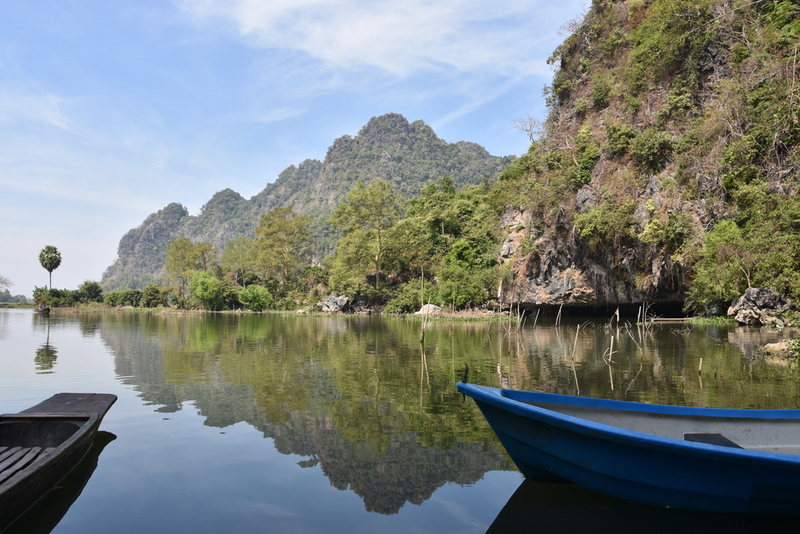 The boat takes you over the lake and through another cave to the other side of the mountain. The cave is narrow and at some place you need to keep low seated to avoid hitting the head against the rock. 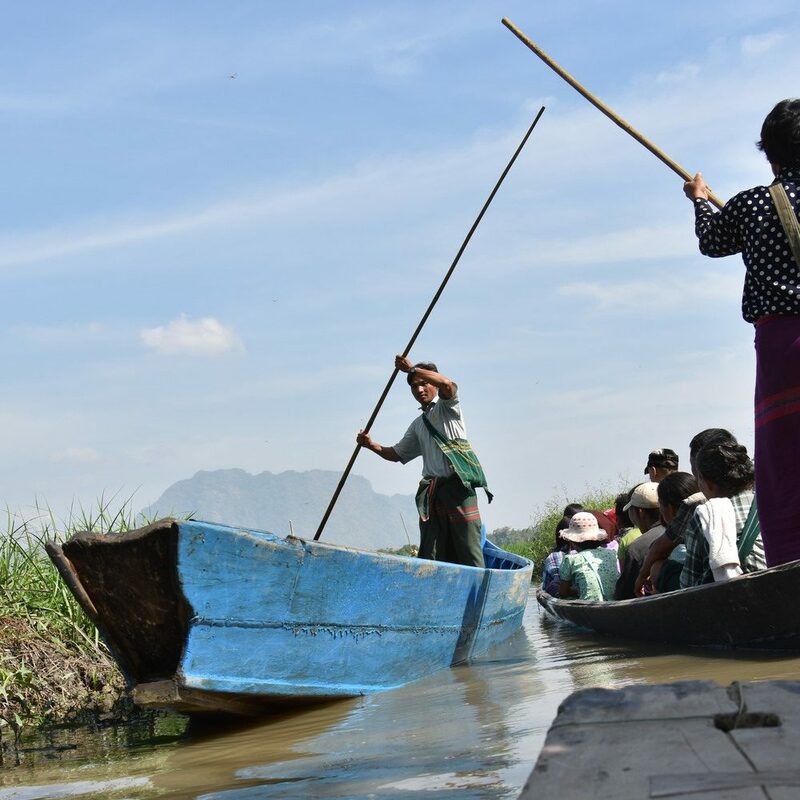 Arriving into daylight again presents you to the rice paddies and the boat sails along narrow canals between the fields, with you just popping the head over the top of the rice or if you are sitting low your head is at root level of the rice. A very special and quite amazing experience. At the end the boat man run the bow up on the edge of the canal and you embarks to the field. A place called the Waterfall – apparently there is a waterfall when water is rich – has a basin referred to as swimming pool. Don’t expect light blue tiles, chlorine smelling water or life guards. The basin is just concrete and the water is unclear, maybe a little muddy, there is no showers or dressing rooms. Further women are not allowed to use the facilities. Except for the little tempting opportunity for a dip the waterfall hosts 5 restaurants. We had our lunch at one of them. We had fried rice with sea-food, large portions tasting good. We paid 2.000 Kyats for 2 persons. It seemed like this is the place to take tourist to eat when they take the tour around Pha-an, because while we dined 5 or 6 other Tuk-Tuk’s made a stop with tourists. Mount Zwe Ka Pin rises 723 meter over the see – and almost the same over the rice paddies. At the western side of the mountain you find a temple. The specialty of this temple is that 1.121 Buddha statues have been installed in a large matrix along the entrance road. These statues of sitting Buddhas stands more than 2.5 meters high, and they all seems to be unique. Different face and positions for arms, hands and legs. Some of the statues are placed under a little roof. 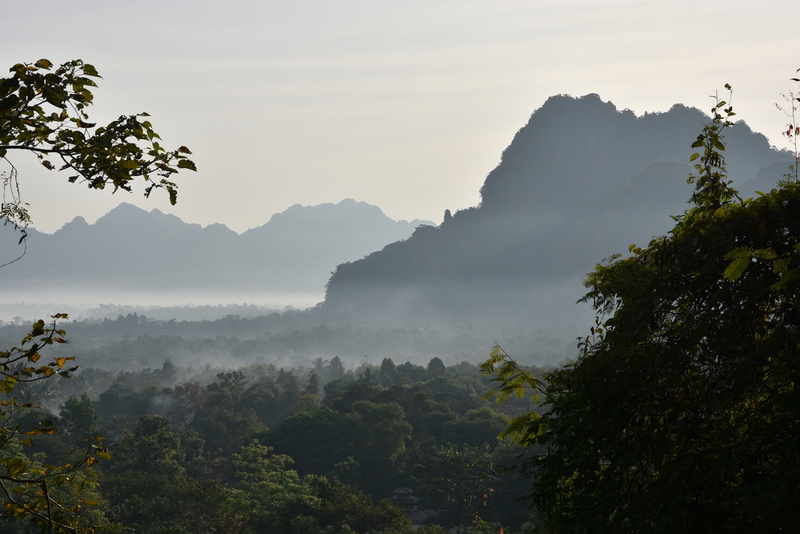 For our day tour around Hpa-an we only had one more sight to see. A nice temple Kyauk Ka Lap which is on top of a small rock in the middle of a lake. To enter the temple you’ll walk a concrete bridge a few hundred meters, before you enter the bridge you’re urged to buy balls of puffed rice to feed the carps and turtles living in the lake. On the island there is a 15 meter high rock with the temple is build into the rock. A monk is sitting at the top of the stairs and blesses the visitors. The Buddhist visitors gets a token to prove they have visited. A new temple has been built on the edge of the lake. In January 2016 it was still being build, but carpets were being laid and arrangements for a reception was taking place, think it was the inauguration. 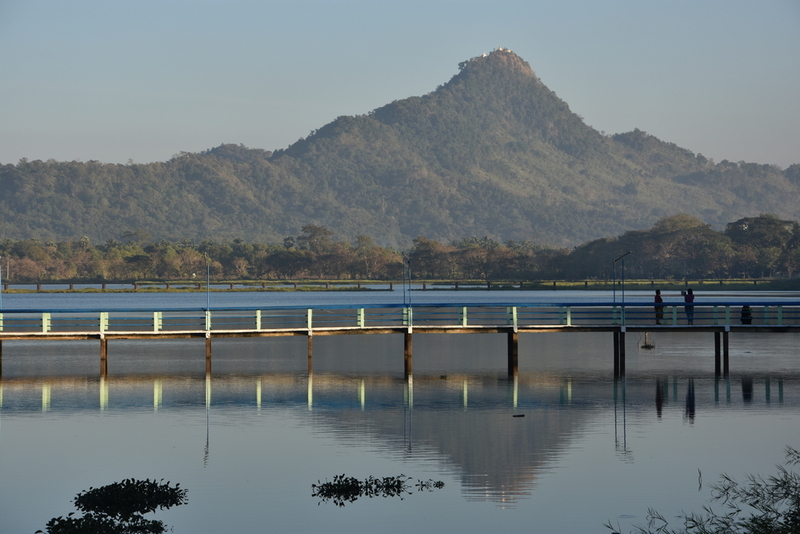 The area around Hpa-an is rich with limestone, some rises high above the area as regular mountains. 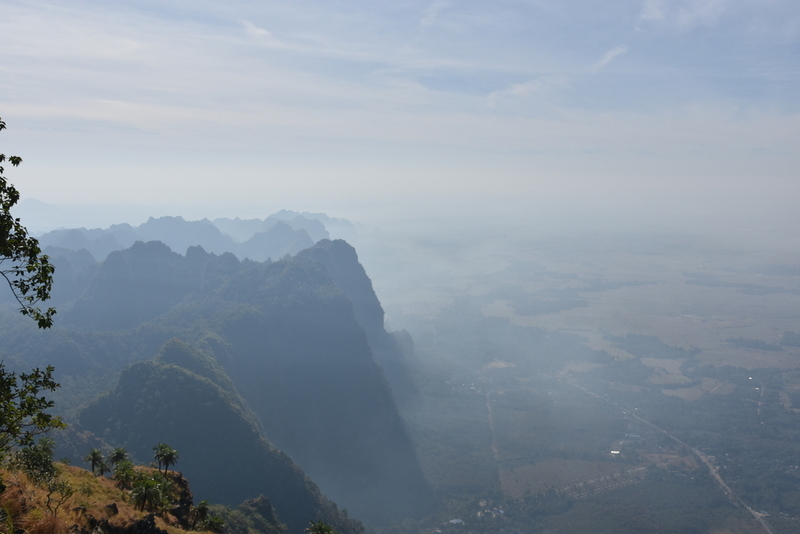 Mount Zwe Ka Pin has a hight of 723 meters above sea level, the plaines around Hpa-an is only 10-20 meters above sea level. And as the mountain rises quite steep is is quite monumental to watch. At the top you can see a pagoda, which golden stupa can be seen from far. To say it is quite easy to climb the mountain is correct when compared with other mountains. Zwe Ka Pin features stairs on both the east and west side so you don’t need any climbing skills or special equipment, but the stairs are made in Myanmar, so expect irregular steps. From the top you have a beautiful view towards both east and west, directly north and south views include the mountain massive. We received the advice to start our climb early in the morning at the east side. 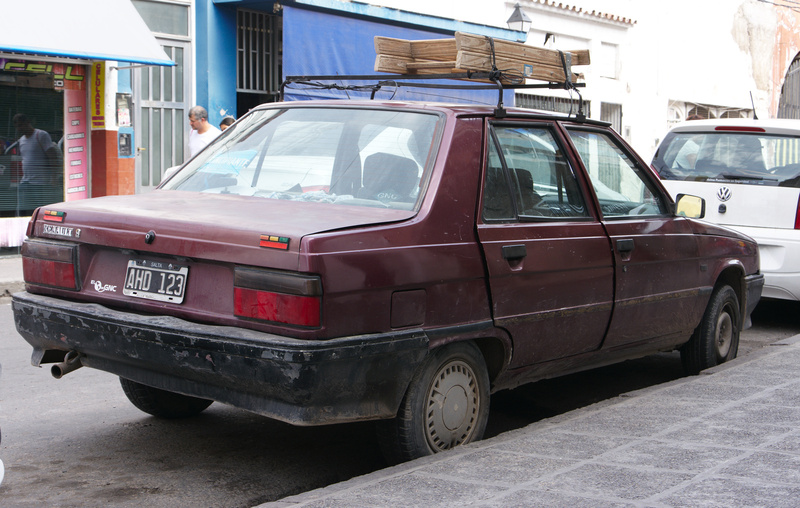 This to have the hardest part handled before temperatures rises and with the sun at the back. We did so and noted that the tour up was handled in about 1 hour 40 minutes. The stair on the east side proved to be in good shape, steep steps however, but most of the way made of new concrete with even surfaces. After having enjoyed the views and having caught our breath we started to decline on the west side. The stairs on the west side is not as fine and even as on the east. Many places concrete steps has eroded to rubble, some where its only a dirt path. Not every where you misses the steps, but on some parts I would have preferred steps (my wife certainly missed steps on the way down). A little more than 2 hours after we started the descent we ordered a well deserved cold drink at a café in the temple below the mountain. If your local gym has a “Stairmaster” or similar contraption I recommend you take some rides in that prior to visiting many Myanmar sights especially Mount Zwe Ka Pin. We hired a tuk-tuk to pick us up at 7 AM, it took us to the east side stairs. The ride takes a little more than half an hour. Our warm clothes were put in the tuk-tuk and we arranged that the tuk-tuk would be ready at the west side 4 hours later. To the south west of the city, across the river, you find a number of caves and temples worth a visit. 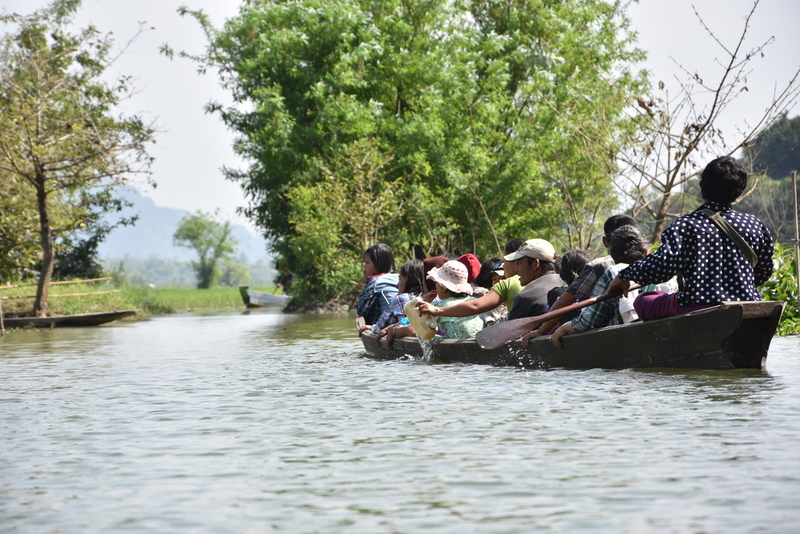 We did not include them in either of our other trips around Pha-an, but had half a day tour for the south west part. The cave is some places refereed to as the cave of ten thousand Buddhas. The entrance fee were 3.000 Kyats. In January 2016 it was no longer required to pay an additional camera fee. 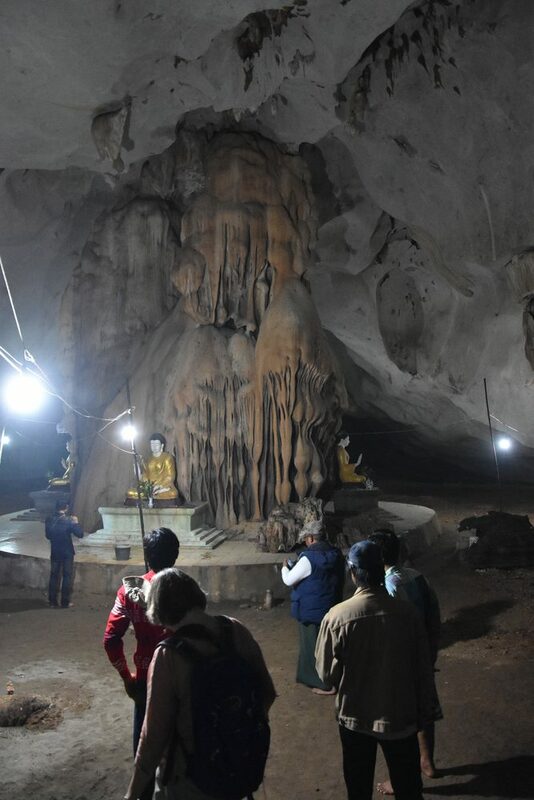 Of course you find a lot of standard Buddha statues around the temple, but the most remarkable element is that Buddha images has been sculptured in clay directly on the rock side of the cave. At the entrance there is a steep concrete stair up to a stupa – some 30-50 meters up. Allow your self the climb as you will be rewarded with a beautiful view of the rice fields and surrounding mountains. 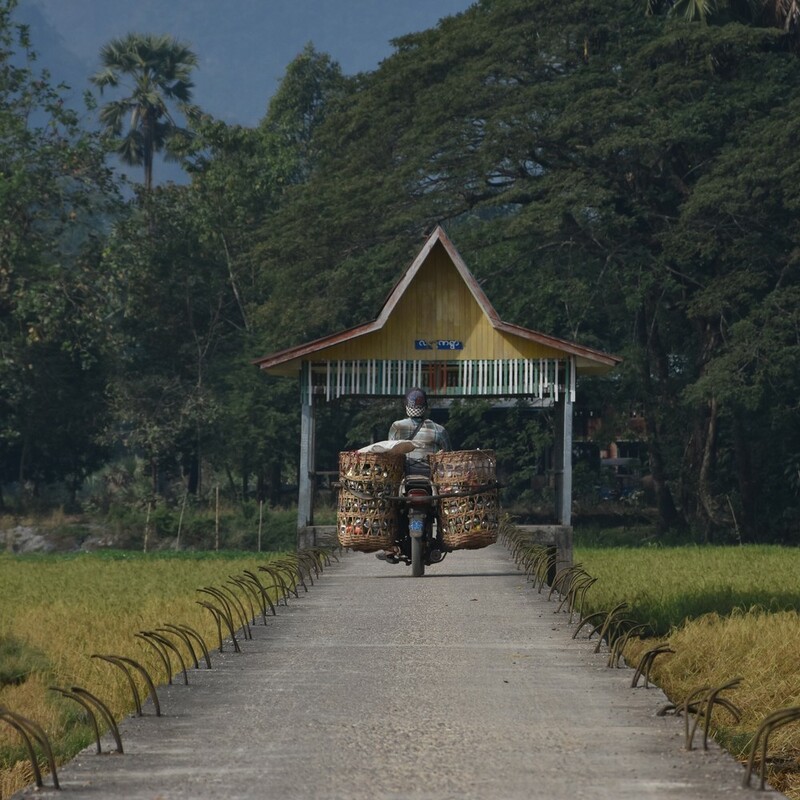 A long concrete path leads to the cave that is surrounded by rice paddies. 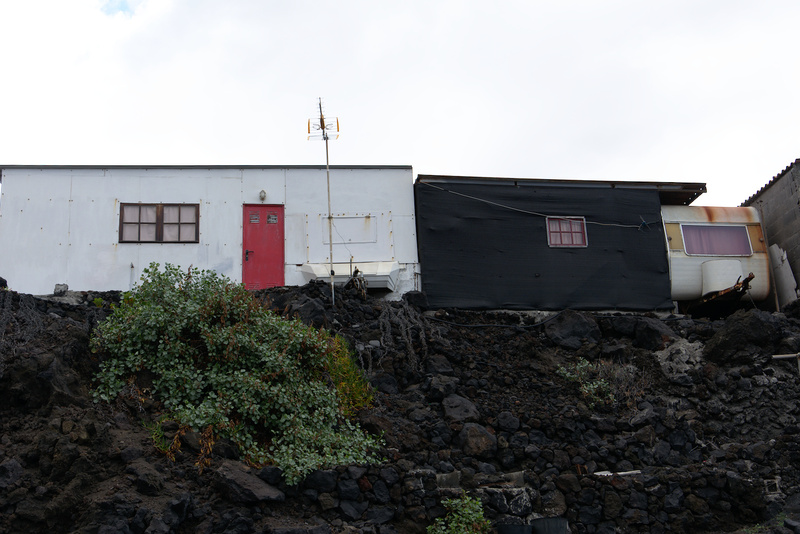 To enter the cave you need to take a 10-15 meter high stair case. In the cave you find several Buddha statues and tableau’s. The front of the cave is lighted with day light and a few light bulbs. The depth of the case is accessible, it’s rather dark, so bring your flashlight. Go through the cave to an opening in the rear, were you can enjoy a view of the surrounding rice paddies. The Bat Cave is home for a large colony of bats. They fly out to hunt food at sun-set, so the cave must be visited at sun-set. Be there a little while before the sun actually sets, so you’ll have the opportunity to climb the wooden stairs and rusty iron ladders to the top of the rocks to enjoy the view of the river. In the beginning only a few bats emerges from the cave, as if they are scouts for the rest, but then the whole colony gets on the wings. It results in a massive stream of bats – 5-10 meters wide stream – that emerges from the opening of the cave. It continued for 15-20 minutes, after which it seemed that the whole colony was out hunting.